In 1961, the name of the Church of England in Australia was officially changed to the Anglican Church of Australia. There was a growing awareness of independence and a sense of identity less reliant on formal, historic ties with England. Developing that awareness, this book acknowledges that the roots of Anglicanism in Australia were English, transported here through invasion and dispossession, and asks how the Anglican Church in Australia can replant itself in authentic Australian soil. 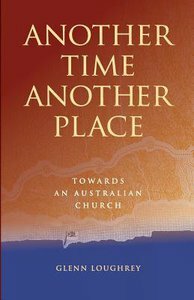 About "Another Time, Another Place"
Glenn Loughrey is an Anglican Priest in the Diocese of Melbourne and the Vicar of St Oswald's, Glen Iris. He identifies as a First Nations Person and is proud to be Wiradjuri. He is an artist, writer and speaker whose style sits at the intersection of the two worlds in which he lives, the First Nation Heritage of his father and the Englishness of his mother. His art and writing recognise both the originality and the similarity of his two worlds and is an authentic attempt to keep them in conversation.